With their elusive and solitary nature, tigers and snow leopards are a challenge for even the most seasoned field biologists to track and study. Yet scientist and conservation leader Eric Dinerstein began his career in the heart of Nepal’s tiger country and the perilous Himalayan slopes of the snow leopard, where he discovered the joys—and frustrations—of studying wildlife in some of the most unpredictable and remote places on Earth. 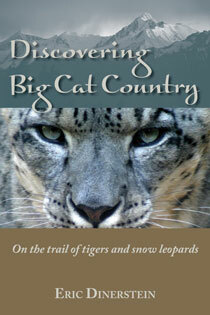 In Discovering Big Cat Country, Dinerstein tells the story of two formative journeys from his early days as a biologist: two and a half years as a young Peace Corps Volunteer in the jungles of Nepal and later, as a newly-minted Ph.D., an arduous trek to search for snow leopards in the Kashmir region of India. In these chapters, excerpted from Tigerland and other Unintended Destinations, Dinerstein paints an evocative picture of the homelands and habits of two fascinating predators, and recalls local partners and fellow conservationists who inspired him with their passion for wild places.